ShaCole and her mentor of three years. Ignite is the mentoring program at Fortress. Launched in 2009 with a single volunteer, Ignite now matches 100% of our After School students in grades 1-5. Ignite is the only Fortress program entirely powered by volunteers, welcoming over 50 volunteers a year who invest one hour a week with their mentee. It is overseen by an on-staff Volunteer Coordinator. 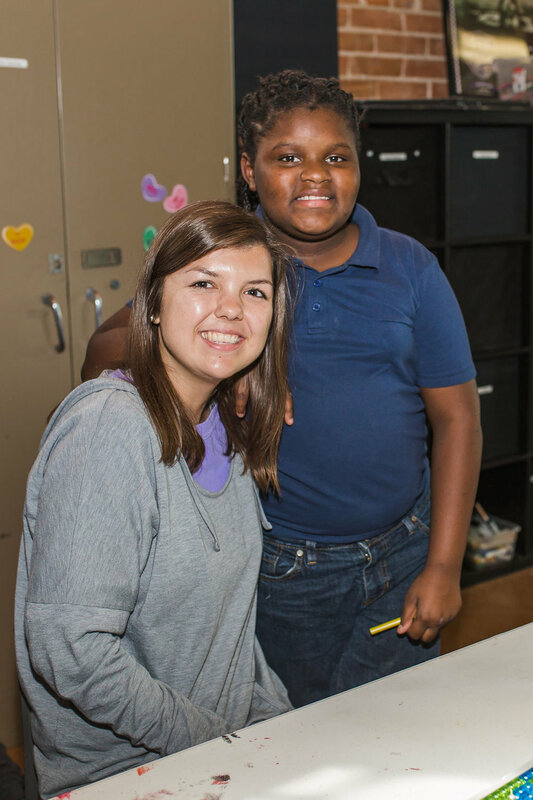 Ignite mentoring tops the list of our kids’ favorite component of the Fortress programs every year. Ignite runs from September-May each year in conjunction with our After School program and takes place on site at Fortress. Mentors are matched one-on-one with a child in After School and commits to spending two semesters with the same child (their mentee) for one hour a week. 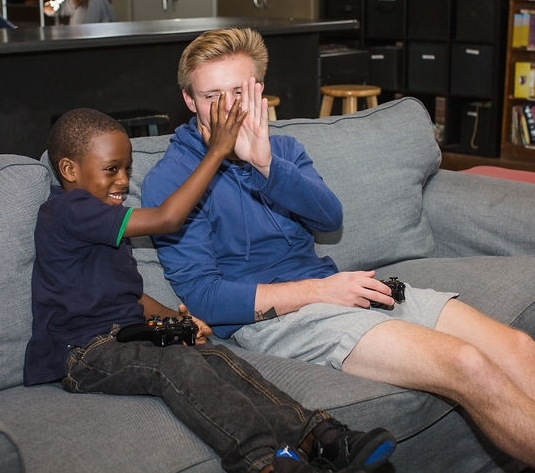 The primary goal of a Fortress mentor is to build an authentic relationship with their mentee that is separate from the child’s other adult relationships with friends, parents, and teachers. Instead, mentors incorporate pieces from all three of those roles to form a unique, trusting bond with a child. The ways mentors and mentees engage with each other is as unique as the participants themselves. Many mentor/mentee pairs prioritize homework & academics during part of their time together. All pairs enjoy hobby and recreation time through the variety of activities available at Fortress’s facility. From arts & crafts to video games, outdoor play to baking, mentors help their mentees explore new and existing interests that require one-on-one attention. Amari and his mentor enjoy a video game together. Mentors are also encouraged to promote healthy social-emotional growth in their mentees, and are kept up-to-date on their mentee’s needs, home & school life, and any ongoing discipline issues they may be having. In keeping with our faith-based mission, mentors are encouraged to share their personal faith with their mentees and to engage in dialogue about the mentee’s faith & beliefs in a respectful way. Ignite mentors apply for the program, and are screened and trained through MinistrySafe, a five-point safety system to protect children and those who serve them. The screening includes a comprehensive background check, on-site interview, one-hour abuse prevention training, reference checks, and policies & oversight that maintain accountability for all parties. Mentors must also complete ongoing training on generational poverty, cultural awareness, child safety, and mentoring best practices to stay compliant and eligible for the program. Robert and his mentor pose on the courtyard. Willow and her mentor complete a craft project. Two mentor-mentee pairs play doubles on the ping pong table. Z’Ariyah and her mentor work on a homework assignment. Tyanna presents her mentor (who grew up at Fortress herself!) with the “Kid’s Choice Award” at the 2018 Volunteer Appreciation Dinner. Tyanna nominated her mentor and wrote an essay about why she deserved to win! Caden and his mentor play a friendly game of Monopoly. 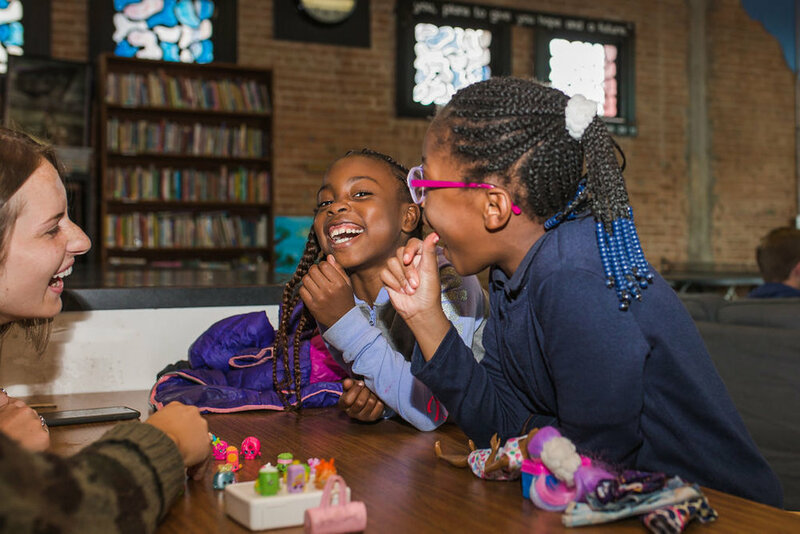 Two Fortress girls giggle over conversation and play time with their mentors.